When snow days hit, it is time for us to bring out the holiday presents we never seem to have time to play with. 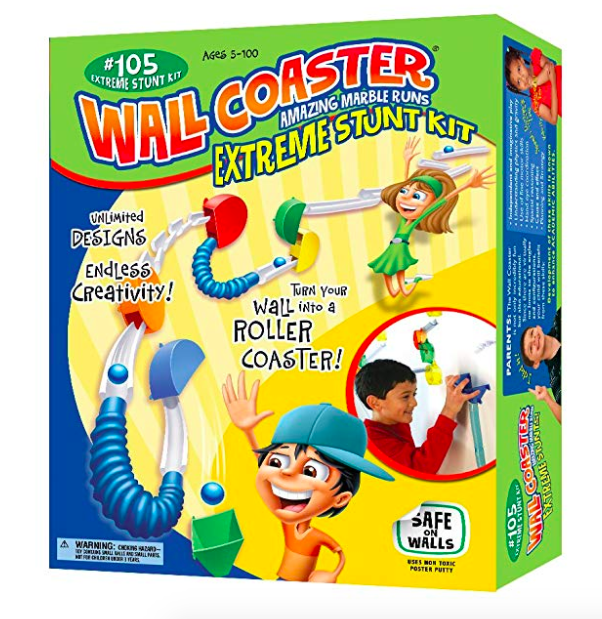 So, this past Tuesday and Wednesday, when the snow totals were about 10 inches and the roads were filled with black ice, we pulled out Wall Coaster, a marble run stunt kit the kids got this past December. The kit, which was invented by a 12-year-old from New Jersey, contains several clear plastic coaster tracks of varying lengths, a few half-circle and 3/4-circle pieces, plastic bendable tubes, a funnel catcher, wall tack, and lightweight marbles. After I helped stick the tack on a few pieces, Becca headed half-way up the steps and stuck the pieces to the wall. She didn't follow any set design on the box , but instead designed her own marble run. She dropped her marble in, watched it go down the tracks, added a few more pieces, and tested it again. Soon, after hearing Becca's "oohs," "ahhs," and giggles of delight, Jordan joined in, and, together, the building of the wall coaster quickly progressed. After a while, they decided to add a few of their own elements--a plastic cup with a small marble-sized hole they punched in the bottom edge, and a paper towel tube sliced in half lengthwise. For about an hour, they tested new runs, changed track angles, and rearranged pieces. Their mission was to have the marble hit a domino down off a box at the bottom of the steps. An hour of working together and not fighting? Priceless! It will work better because it will have more momentum. I'll do it! I'm good at physics! Where does this go wrong? See if we can get two in a row! Let's take this time to improve it! Best idea ever--I just got Post-its! Why does it always fail here? Time for one of my amazing tubes! I especially loved their united "awwwws" when the marble prematurely flew off the tracks, and their joint cheers when the marble landed at its final destination (which they decided would be in a sock they had taped to the wall). I also loved their genuine and innate interest in science as they tried new routes, tested their ideas, and worked together to get it to work. Sometimes, the best science experiences involve paper towel tubes, Post-Its, a holey plastic cup, and a sock stuck to the wall. Be on the lookout for your Girl Scout Cookies!